The White House hit back hard Tuesday afternoon at charges in a new book by former House Intelligence Committee Chairman Peter Hoekstra that the Obama administration is primarily responsible for turmoil in Libya through its support of the overthrow of strongman Moammar Gadhafi. Press secretary Josh Earnest insisted "a careful consideration of his long record would probably not conclude Col. Gadhafi was not a friend and ally of the United States." "There's no denying there were times where he may have been helpful," Earnest told me at a White House briefing, "But I certainly don't think that outweighs his complicity in previous acts of terror, including those that targeted Westerners." Earnest concluded that this "certainly doesn't outweigh the acts of atrocity that were carried out under his rule inside of Libya against the Libyan people. The desire of the Libyan people to have a different leadership is quite understandable in that light." Hoekstra's "Architects of Disaster," which last week overtook Henry Kissinger's "World Order" as the top-selling foreign policy book on Amazon, points out that, as vicious a tyrant as Gadhafi was, the Libyan had disposed of his weapons of mass destruction. Most importantly, Hoekstra's book argues, Gadhafi, in the years before his overthrow in 2011, was assisting the U.S. in gathering intelligence on ISIS in its early stages. Although Libya is now engulfed in lawlessness and has no functioning central government, Earnest told me that "the challenge for the United States is to try to build a relationship with the new government of Libya, to facilitate the success of those kinds of democratic institutions . . . because we know they reflect the will of the Libyan people, but also they can also be helpful to the United States as we seek to protect our interests and to protect the interests of the American people even in dangerous places in the world like Libya remains today." In an interview, Hoekstra responded, "Obviously we decided for them that it would not be Gadhafi. And exactly what government of Libya is he expecting the United States to build a relationship with?" The former Michigan congressman told me that "Four years after Gadhafi's killing, the Obama administration is still waiting for the script on a Libya without Gadhafi to be written. I don't believe they gave former President Bush four years for the final script on Iraq without Saddam to be written. They harshly judged President Bush quickly. 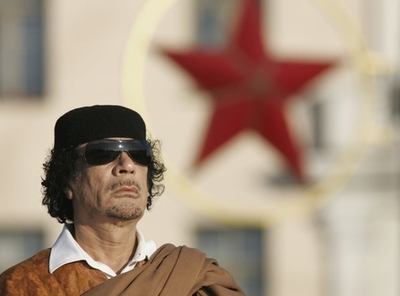 "Libya is a failed state with no resolution or U.S. strategy in sight. At least Mr. Earnest's answer is better than Secretary of State Clinton's answer, which is that it was the best example of the use of smart power. Both should just admit it was a failed strategy and tell us what lessons they learned from it." Now a deceptive word from "our sponsor"
Failed strategies, "Architects of Disaster" we might well get used to it. All perceptions are sponsored TV, print internet the radio all of it, religious or secular. Our thoughts are not our own, we are led from oppressor to oppressor; by truth that lacks some vital details.- Follow the money, ask who is profiting?